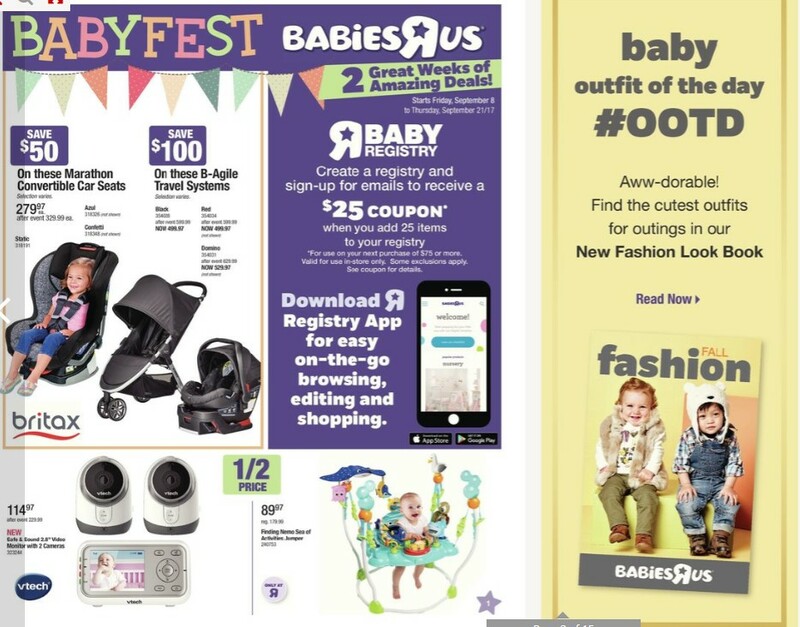 Babies R Us Baby Fest Flyer Fri Sep 8 – Thu Sep 21, 2017. 2 Great weeks of amazing deals Britax Marathon Convertible Car Seats - Confetti #318348 Regular Price $329.99 - Sale Price $279.97 save $50.00 Selected varies. Britax B-Agile Travel System - Red #354034 $599.99 Regular Price - Sale Price $499.97 Save $100.00 Selected varies. Britax B-Agile Travel System - Black #354028 Regular Price $599.99 - Sale Price $499.97 Save $100.00 Selected varies. 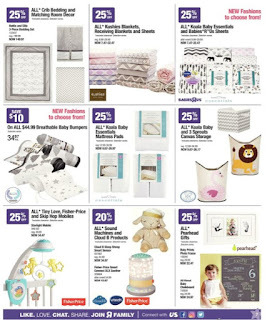 Find baby big deals on brands for babies only at Babies R Us flyer store Canada. 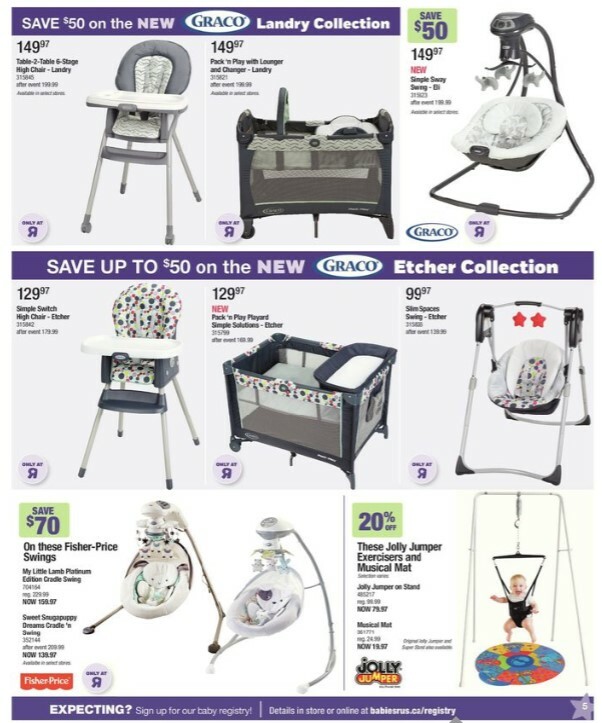 Graco Verb Click Connect Travel System - Bijou Model #: 743175 - Now Price $199.99 While they last. No rainchecks. 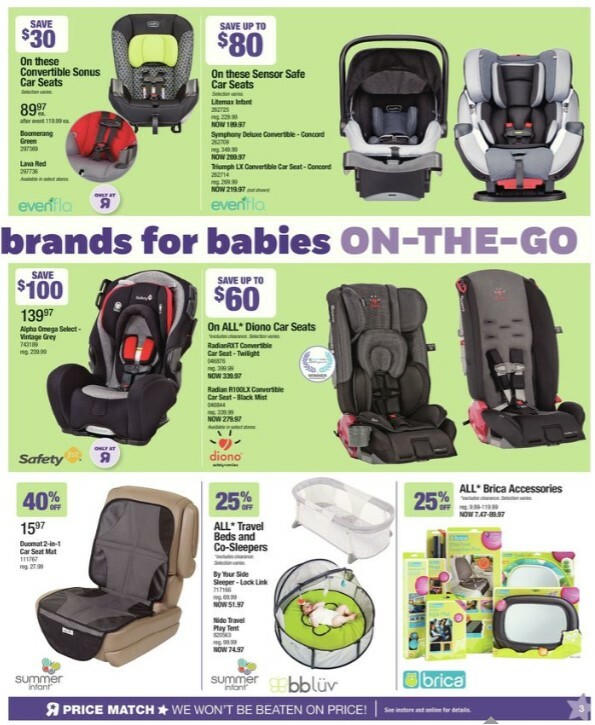 Graco Nautilus Multi-Stage Car Seat - Polar Model #: 743146 Regular Price $299.99 - Now Price $219.97 $80.00 Savings Available in select stores. 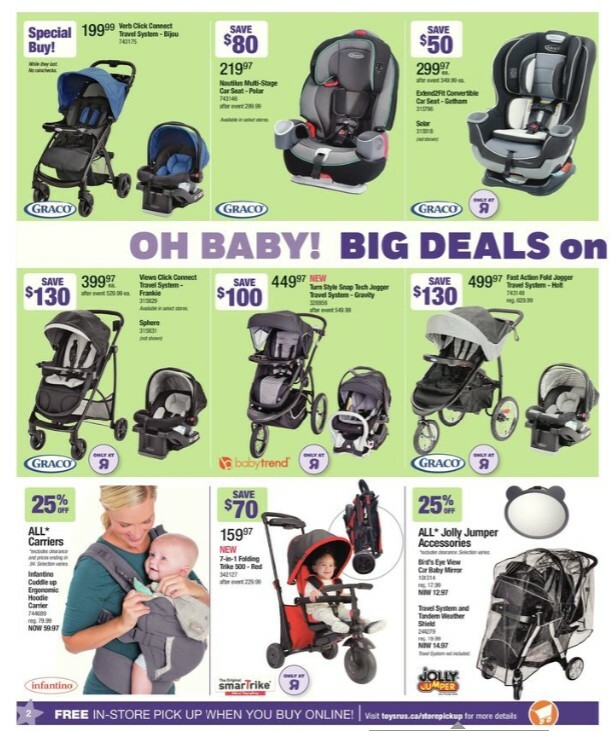 Graco Extend2Fit Convertible Car Seat - Gotham Model #: 315796 Regular Price $349.99 - Now $299.97Price $50.00 Savings Solar, not shown (315818). 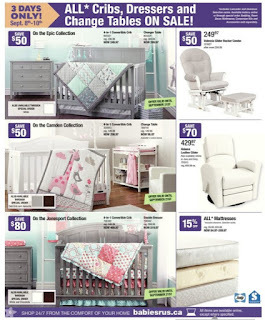 Graco Views Click Connect Travel System - Frankie Model #: 315829 Regular Price $529.99 - Now Price $399.97 Save $130.00 Available in select stores. Sphere, not shown (315831). 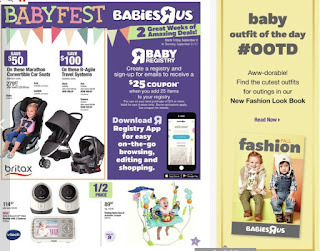 Babytrend Turn Style Snap Tech Jogger Travel System - Gravity Model #: 328858 Regular Price $549.99 - Now Price $449.97 $100.00 Savings The baby trend turnstyle snap tech jogger travel system is the perfect choice for enjoying excursions with your little one. Infantino Cuddle Up Ergonomic Hoodie Carrier Model #: 744689 Regular Price $79.99 - Now Price $59.97 Comfortable, ergonomic seat for baby. Jolly Jumper Travel System And Tandem Weather Shield Model #: 244279 Regular Price $19.99 - Now Price $14.97 Travel system not included. Evenflo Convertible Sonus Car Seats - Boomerang Green Model #: 297369 Regular Price $119.99 - Now Price $89.97 Save $30.00 Selection varies. Evenflo Sensor Safe Car Seats - Lifemax Infant Model #: 262725 Regular Price $229.99 - Now Price $189.97 Save Up to $80.00 Selection varies. Safety 1st Alpha Omega - Vintage Grey Model #: 743189 Regular Price $239.99- Now Price $139.97 $100.00 Savings Select. 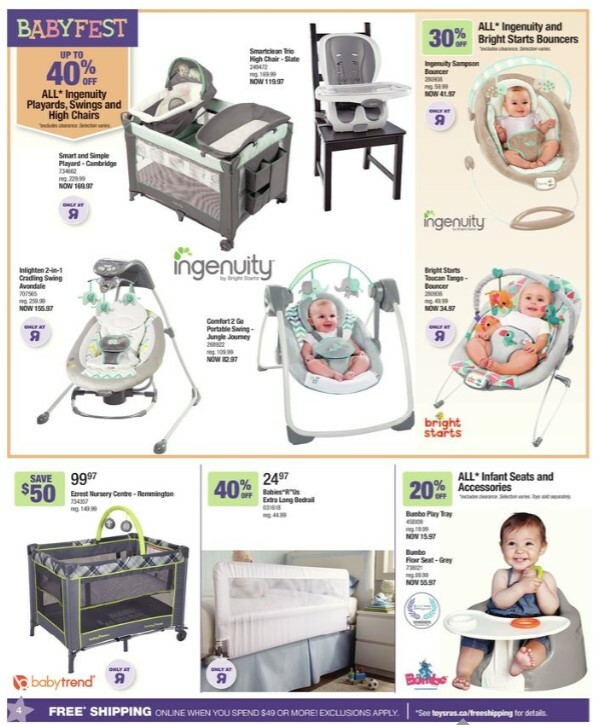 Babies R Us Babyfest product on sale flyer this week such as All Ingenuity Playards, Swings And High Chairs Up to 40% Savings Excludes clearance. Selection varies. Ingenuity Smartclean Tro High Chair-Slate Model #: 249472 Regular Price $169.99 - Price $119.97 The soft foam seat pad adds extra comfort for baby and wipes clean instantly! The EasyClean tray removes with one hand, is dishwasher-safe, and features four locking positions to grow with baby. 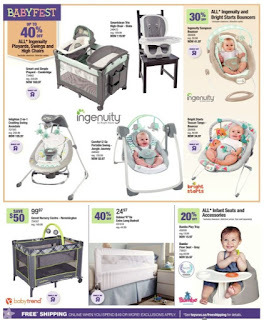 Ingenuity Sampson Bouncer Model #: 280938 Regular Price $59.99 - Price $41.97 Designed with parenthood in mind. 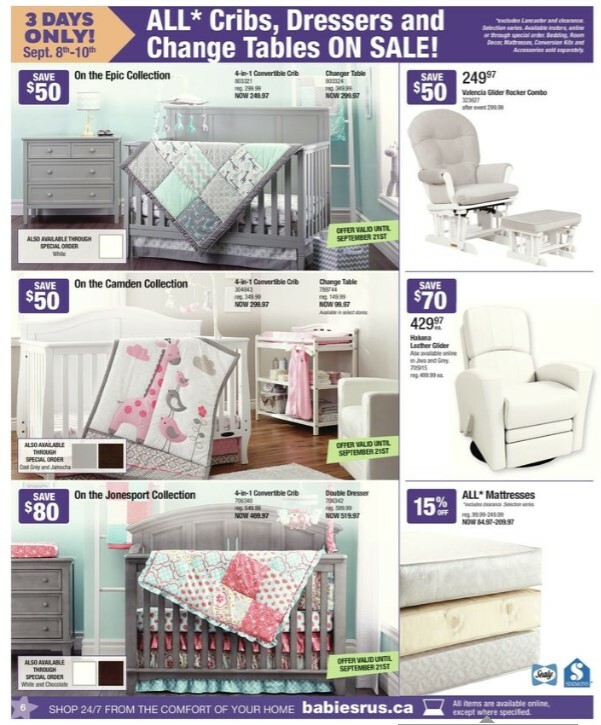 Ingenuity Inlighten 2-In-1 Cradling Swing Avondale Model #: 707565 Regular Price $259.99 - Price $155.97 The LightBeams electronic mobile keeps baby happy with moving lights and plush toys. Bright Starts Toucan Tango-Bouncer Model #: 280936 Regular Price $49.99 - Price $34.97 Taggies tags engage baby and provide comfort and security. Babytrend Ezrest Nursery Centre-Remmington Model #: 734357 Regular Price $149.99 - Price $99.97 save $50.00 Your little one will be entertained with the two adorable toys located on a removable toy bar.